The Owlbear Army may soon become a snuggly, plushie reality! 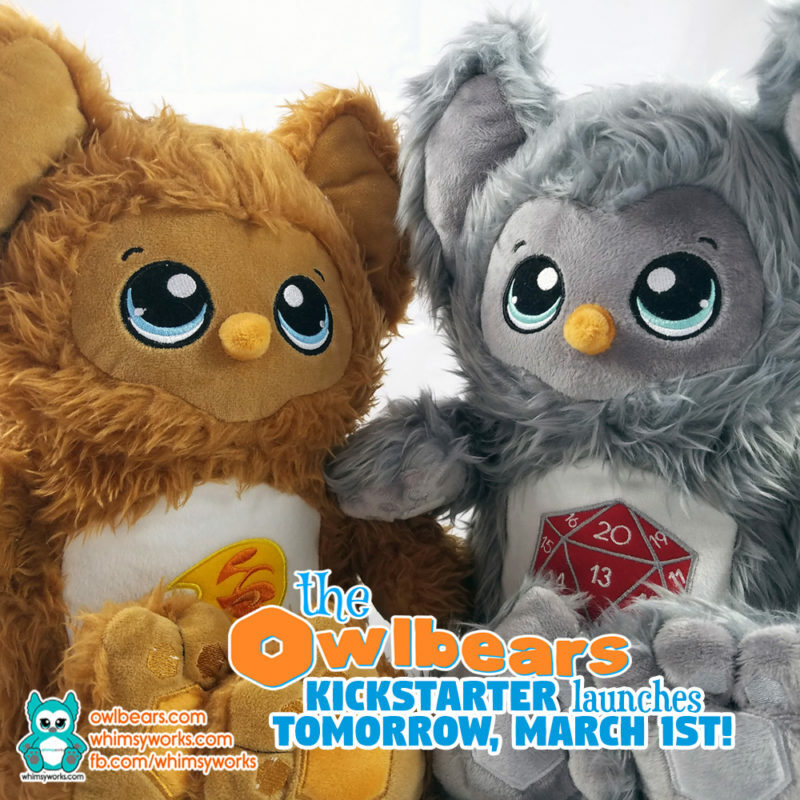 Our Owlbear Designer Plush Kickstarter launches today, March 1st at 10am! Each Owlbear plush will be 12 inches tall and made of high quality faux fur and super soft minky fabric. The face and tummy details are professionally embroidered. After our first foray in the world mass plush toy production we feel like we’ve learned quite a lot. While we may not know EVERYTHING about it we certainly did learn many important lessons. This time around we made sure to have the prototypes for the primary goal and the first stretch goal in our hot little hands before launching. With our previous Kickstarter for the Wee Beasties plush toys we had expected to have the prototypes done by launch but that was SO not the case. Fireball is our primary goal for this Kickstarter campaign. He will be an orange plush with blue eyes and a fireball Paunch Patch. The only change to Fireball will be his fur color. The factory will either source the proper color fabric or dye his fur to the appropriate shade of orange once they are paid. This is simply the nature of the business. If we are able to meet our primary goal to fund Fireball we will then focus on unlocking our first stretch goal: Icosa! Icosa is an adorable grey plush with aqua eyes and a D20 die as his Paunch Patch. No revisions are planned for Icosa so the plush you receive will look like the prototype pictured. We need YOUR help to make these guys a reality! If you would like an Owlbear of your very own, we would be so very delighted if you would back our project! More importantly, we would really appreciate it if you could help us spread the word by boosting the signal! Please share our Kickstarter via your various social media accounts. If you know of any forums, groups, clubs, and the like who would be interested in our project, please share our Kickstarter link with them as well! These guys have been incredibly fun to design and we are excited about all the possibilities! If you have any ideas for an Owlbear plush please be sure to let us know! 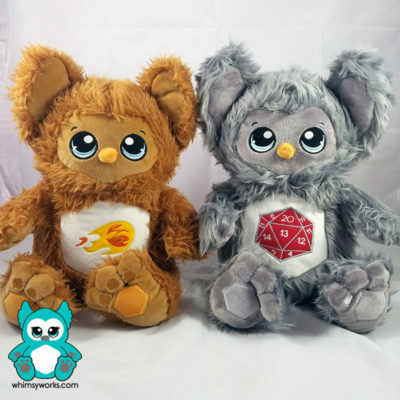 This entry was posted in Kickstarter, Owlbears, Plush and tagged dungeons and dragons, geeklings, gifts, kickstarter, owlbear, Pathfinder, plushie, plushies, RPG. Aww, these owlbear plushies are so cute!